The Acquisio Summit is around the corner and while everyone in the office is buzzing about it, we wanted to share the top 5 reasons why you should get excited too. Whether you’ve already bought your ticket or if you’re still trying to fit the Summit into your schedule, here‘s what you have to look forward to at this year’s Acquisio Summit on July 29th and 30th. Let’s face it, part of the reason you choose one event over another is because of location. Montreal brings a European flavor to Canada and to North America, and in the summer, the atmosphere in the city is alive and infectious. Of course, the city’s food and entertainment shouldn’t be the main reason for attending the Summit, the event is about furthering your knowledge on relevant digital marketing strategies and learning how Acquisio’s growing offering can help you do that, but we know location is important to you so we’re just trying to keep it real by saying Montreal is an awesome city that you will definitely enjoy. If you haven’t tried Montreal’s famous smoked meat sandwiches or poutine (fries with gravy and cheese curds), both local lunch favorites will be served at the Acquisio Summit for you to try. Let’s get to the reason your boss wants to hear – the Acquisio Summit will be a great place to network with peers and potential clients. The first Acquisio Summit welcomed platform users together and shared insights about Acquisio’s functionality. This time, the event is open to anyone in the digital marketing industry, whether they are clients, prospects or simply interested in learning from some of the leaders in search marketing. We’ve broadened our session themes, making them more welcoming to those hoping to gain insight on the industry and not just Acquisio. Coupled with the informative info session about the evolving platform, the Summit will be a truly valuable experience. With clients and interested marketers together at one event, this translates to better network opportunities for you and your business, since in one room you can meet with partners, vendors, clients, mentors and more. Similar to our previous Summit, we will be running two sessions. One session will be for users, account managers and those who want to attend more practical sessions, where they can take away what was learned at the Summit and use it to advance their campaigns. The second session will be aimed at executives, CEOs, business owners, and those who are looking for high level strategic insight and direction for their business. As mentioned, the topics covered at the Summit (which can be viewed here) are open and relevant for those who have never used Acquisio a day in their life and for those who use it on a daily basis. The idea of this Summit was to share and grow ideas about important areas of search marketing, so there will always be a session of interest to you, whether you want more of a user approach or a business session. Acquisio is traditionally known as a search marketing software that specializes in managing and reporting on PPC ads, but we want to break out of that mold and redefine ourselves at this Summit. Without giving away the punchline, we want attendees to know that we understand that mobile and local marketing is the future and we have made it a major focus at this event. Whether you’re running mobile ads, help manage campaigns for local businesses or simply want to learn more about how you can improve your capabilities in the area, the Acquisio Summit will cover best practices for mobile and local throughout the event. Nearly every time slot with have a local or mobile session available, either in the user or business track. If you’re in the mobile and local market, there will be lots of juicy info to benefit from. A summit is worthless if it doesn’t share valuable information with attendees, and what better way to guarantee actionable insight is shared than to ask some of the most influential experts in search marketing to come speak at the event. Marc Poirier, CEO of Acquisio and one of the top 25 most influential people in PPC will start the Summit off with some big announcements. He’ll be followed by a representative from Microsoft, the Platinum Sponsor of the event, and will provide strategic insight and learnings from their experience building features at one of the largest software companies in the world. Other big names speaking at the event include Lee Goldberg, President of Vector Media Group, John Lee, Managing Partner at Clix Marketing, Jeff Allen, President of Hanapin Marketing and Brad Geddes, Marketing Consultant, Speaker, Serial Entrepreneur and Co-Founder of AdAlysis. You may have seen or heard some of these guys speak at SMX, Hero Conference, Pubcon, AdTech and more, this time around, the experts will be teaming up for a variety of sessions on everything from crafting campaigns that work to surviving Mobilegeddon. Need more reasons to come to the Acquisio Summit? Contact someone from Acquisio and we’ll give you a handful more reasons and details to convince you. 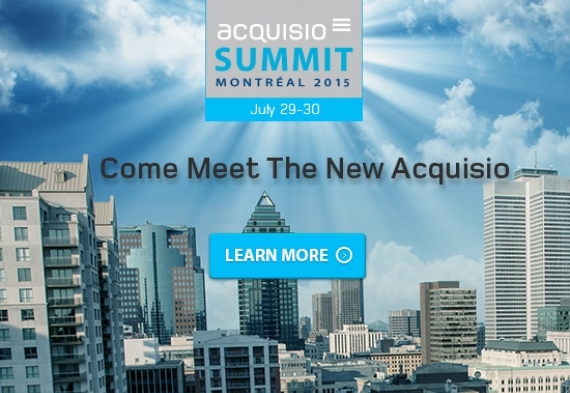 Acquisio Summit 2015 is Happening!